SHIELD: Azure, within an orle or bordured of bezants, 23 visible, an armored fist wielding a mace, both Argent, and a canton of three bars, Azure Or and Gules, fimbriated Or. CREST: On a wreath of the colors, Or and Azure, on a grassy knoll St. George in full armor Proper, a birch sprig on his helmet, with mantling Argent charged with a cross or upon the cross of St. George and mounted on a war horse Argent, harnessed Azure, spearing with a golden lance a sea dragon Gules gorged with a collar Azure bearing two Gold mullets, and the number 31 appearing on a harness ornament. MOTTO: On a scroll Azure doubled Or the motto “FAST AND FEARED” in Gold letters. SEAL: The coat of arms emblazoned upon a white oval enclosed within a blue collar edged on the outer edge with a gold rope and inscribed with the words “USS ARLEIGH BURKE” at the top and “ DDG 51” in base all in gold letters. SHIELD: Blue and gold represent the Navy. The orle, symbol of distinction, stands for the outstanding achievements in battle of Admiral Burke against the naval power of Japan, a formidable foe.The fist and mace symbolize the offensive and defensive power of the new destroyer. The mace, also a symbol of authority, represents Admiral Burke’s outstanding service as Chief of Naval Operations. It also refers to Admiral Marc Mitscher, an influential figure and mentor, for whom Admiral Burke served as Chief of Staff.Admiral Burke’s Destroyer Squadron 23, represented by the bordure of 23 bezants, was the only United States Destroyer Squadron awarded a Presidential Unit Citation signified by the canton of blue, yellow, and red. The bezants also refer to the year 1923 in which Arleigh Burke was graduated from the United States Naval Academy at Annapolis. Twenty-three also reflects Admiral Burke’s distinguished service on the staff of the Chief of Naval Operations as OP-23. CREST: The mounted figure of St. George recalls Admiral Burke’s celebrated victory in the Battle of Cape St. George over Japanese naval forces. His mantle bears a gold cross for the Navy Cross awarded to the Admiral. The birth branch on the helmet represents Admiral Burke himself, a reference to his name derived from the Scandinavian patronym Bjorkegren. The red sea dragon symbolizes Japanese naval power assaulted by the forces under Commander Burke’s command. It is gorged with the two gold stars he was awarded for outstanding service. The lance implaling the dragon signifies ordnance on target. The capabilities of the new destroyer , the most powerful and survivable ever built, are signified by the full armor and equipment of the warrior St. George. The Admiral ‘s nickname “31-knot Burke” is recalled by the number 31 on the horse’s harness. SHIELD: Barry of six Argent and Gules, a pile wavy Azure charged with a lion rampant Or armed and langued Gules, between, on the Argent bars in fess and base, four mullets Azure. CREST: Issuing from a wreath of the colors (Argent and Gules), the frigate United States, Captain Barry’s last command, making headway at full sail, all Proper. MOTTO: On a scroll Azure, the motto “STRENGTH AND DIVERSITY” in Gold letters. SEAL: The complete coat of arms in full color as in the blazon upon a white oval background enclosed by a dark blue border with an outer edge of gold rope inscribed “USS BARRY” at top and “DDG 52” in base all in gold. SHIELD: Red, white, and blue are our National colors. The field of bars, adapted from the Barry coat of arms, is a reference to Captain John Barry for whom the ship was named. The stars recall the four battle stars awarded to the second Barry in World War ll and represent all four ships to bear the name Barry. The wavy pile represents the US Navy fleet in which Captain Barry held the first commission. The lion symbolizes courage and strength. Gold stands for excellence ; red and white for courage and integrity. CREST: The frigate United States symbolizes the unbroken tradition of patriotism, valor, fidelity, and ability from our Navy‘s beginning to the present, and represents the maritime supremacy of our country. It also honors the heritage of the three previous ships to bear the name Barry. The stars and bars together symbolize the United States and refer further to Captain John Barry’s ship of that name. MOTTO: Strength is derived from the formidable power which USS Barry (DDG 52) will take to sea while Diversity refers to the ship’s multi-mission capability, a capability which extends to all naval warfare contingencies. The motto also represents the strength our Nation derives from its cultural diversity, as evidenced by the contribution of Captain Barry, an Irish Immigrant to the founding of our country. SHIELD: Per fess wavy (in the manner of a Taeguk) Gules and Azure, a lion rampant Or charged on the shoulder with an escutcheon Argent bearing a cross throughout Gules; a bordure of the third pellety. CREST: From a wreath Or and Gules a Marine Mameluke and Naval sword saltirewise points up Proper superimposed by a mullet one point down Celeste fimbriated Argent. SUPPORTERS: On either side of the shield a halberd Proper. MOTTO: A scroll Sable edged and inscribed “ONWARD WITH VALOR” in Gold. SEAL: The coat of arms as blazoned in full color upon a white oval enclosed by a dark blue collar edged on the outside with a gold rope and bearing the inscription “USS BENFOLD” at top and “DDG 65” in base all in gold. SHIELD: The Aegis shield the capability of DDG 65 to conduct operations in mult-threat environments. Dark Blue and gold are the colors traditionally associated with the Navy; red is emblematic of valor and sacrifice. The lion embodies valor and strength, symbolizing Hospitalman Benfold’s courage and gallantry. The escutcheon bears a red cross, alluding to Benfold’s medical service and personal sacrifice in saving the lives of others. A background of red above blue in the manner of a Taeguk underscores his service in Korea. The black pellets symbolize the heavy artillery and mortar barrages during his heroic action. CREST: The reversed star, in medium blue and white, denotes the Medal of Honor, which was posthumously awarded to Hospitalman Benfold for his spirit of self – sacrifice and extraordinary heroism. The crossed Navy sword and Marine Mameluke signify cooperation and strength; the Mameluke signifies Benfold’s service with the First Marine Division in Korea. SUPPORTERS: The halberds symbolize vigilance, resolve and battle preparedness while suggesting the USS BENFOLD’S Vertical Launch capabilities. SHIELD: Azure (Blue), an anchor Argent (White); on a bordure wavy Gules (Scarlet) fimbriated of the second thirteen mullets Or (Gold). CREST: On a wreath Argent and Azure, in front of a laurel wreath, a Naval officer’s sword and a Marine Corps Mameluke hilts to base saltirewise Proper; overall a representation of a gold eagle, arrows and base Or displayed in the U.S. Senate Chamber of the Capitol Building, holding in its beak a serpent Gules. MOTTO: A scroll Azure fimbriated and inscribed “COMMANDING THE SEAS” Or. SEAL: The coat of arms as blazoned in full color upon a white oval enclosed by a dark blue collar edged on the outside with a gold rope and bearing the inscription “USS CHAFEE” at top and “DDG 90” in base all in gold. CREST: The swords symbolize Senator Chafee’s distinguished service in World War II and Korean War, the many decorations he was awarded to his Marine company’s heroic combat achievements, and the readiness of DDG 90 to engage in combat. The laurel wreath, symbol of leadership and vigor, recalls the Senator’s service to his country as a Marine, statesman, three time Governor of Rhode Island (1962-1968), and as a conservationist to preserve the environment. The eagle refers to his role as United States Senator (1976-1999). Scarlet and gold signify respectively courage and merit. SHIELD: Per chevron Argent and Azure, in base a demi-trident bendwise issuing from sinister base Proper, on a chief Gules a cross patee convexed of the second fimbriated of the first charged with a mullet of the like. CREST: From a wreath Argent and Azure a palm wreath Proper superimposed by an anchor of the second, overall a stylized Hawaiian warrior helmet Proper garnished Gules and Or. MOTTO: A scroll Azure edged Gules doubled and inscribed “ Imua e na Koa Kai” (Hawaiian for “Go Forward Sea Warriors”) Azure. SUPPORTERS: A United States Naval sword and a cutlass saltirewise points up Proper. SEAL: The coat of arms as blazoned in full color upon a white oval enclosed by a dark blue collar edged on the outside with a gold rope and bearing the inscription “USS CHUNG-HOON” at top and “DDG 93” in base all in gold. SHIELD: Dark blue and gold are colors traditionally used by the Navy and recall the sea and excellence. Red is the color of zeal, courage and sacrifice. The trident and three tines represent maritime dominance from the combination of air, surface and undersea warfare technologies into a single AEGIS platform. The octagon shield shape alludes to the AEGIS configuration on a DDG. The ship’s namesake honors Navy Rear Admiral Gordon P. Chung-Hoon, recipient of the Navy Cross and Silver Star, for his conspicuous gallantry and extraordinary heroism as Commanding Officer of the Sigsbee, DD 502. He valiantly kept his antiaircraft batteries delivering effective fire in the face of catastrophic damage by a Kamikaze. SHIELD: Azure, a chevron rompu Gules fimbriated Or charged with three hand grenades Proper, issuance from base a demi-trident of the third. CREST: From a wreath Or and Azure and flanked on either side by a laurel branch, a French horn surmounted by a Marine Mameluke and Navy sword saltirewise points down Proper, overall a mullet inverted Celeste. SEAL: The arms as blazoned in full color upon a white oval enclosed by a dark blue collar edged on the outside with a gold rope and bearing the inscription “USS COLE” at top and “DDG 67” in base all in gold. SHIELD: Dark blue and gold represent the sea and excellence and are traditionally associated with the Navy. Red, for blood and courage, denotes valor and sacrifice. The trident symbolizes sea prowess and DDG 67’s modern warfare capabilities of the Aegis and Vertical Launch systems. The three tines represent submarine, surface and air strike capabilities. The three hand grenades commemorate Sergeant Cole’s heroic one-man grenade attack against the enemy emplacements during the assault on Iwo Jima. Three times, under fierce hostile fire, he assaulted their position destroying the enemy stronghold. When returning to his squad, he himself was killed by a grenade. The broken chevron, or wedge, alludes to Sergeant Cole’s breaking the enemy’s hold, enabling his company to attain its ultimate objective. The three grenades also represent the traits courage, valor and honor, commemorating Sergeant Cole’s fighting spirit and dedication. CREST: The blue reversed star highlights the Medal of Honor posthumously awarded to Sergeant Darrell Samuel Cole for his self-sacrifice and extraordinary heroism. The crossed Marine Mameluke and Navy sword signify cooperation and reflects the fighting spirit. The French honor underscores his service with the Marine Corps as Field Music and is combined with the swords to symbolize his nickname, “The Fighting Field Music.” The laurel wreath is emblematic of honor and high achievement. SHIELD: Azure, an officer’s sword and a seax points down saltirewise Proper enfiled by a celestial crown Gules garnished Or. CREST: From a wreath Or and azure a ship’s mast with the sails furled and a burgee command pennant flying Proper. MOTTO: A scroll Argent edged and doubled Azure inscribed “IN PURSUIT OF PEACE” Gules. SUPPORTERS: A sprig of oak and olive saltirewise, entwining the scroll. SEAL: The coat of arms as blazoned upon a white field enclosed by a dark blue oval border edged on the outside with gold rope and inscribed “USS DECATUR” above and ‘DDG 73” below in gold letters. SHIELD: Dark blue represents the Navy and the oceans, its realm. The seax recalls a series of victories by Stephen Decatur over sea forces of North African terrorist nations including his daring destruction of the captured frigate, Philadelphia. The English Officer’s sword symbolizes Decatur’s brilliant victory over HMS Macedonian during the War of 1812 in one of the greatest single-ship actions of naval history. The celestial crown represents anti-air warfare capabilities and bears five mullets, one for each of the ships named Decatur up to and including the newest ship. It also recalls Stephen Decatur’s engagements against the British during the War of 1812. Scarlet denotes courage; gold symbolizes excellence. CREST: The heritage of the name Decatur is recalled by the ship’s mast and sail, recalling the Navy of Stephan Decatur’s time and the first vessel to bear his name, a sloop-of-war built in 1838. The mast also refers to the traditional pine construction of the vessels of Decatur’s navy. The pennant symbolizes the senior naval authority earned by t he ship’s namesake, Commodore Stephen Decatur. SUPPORTERS: The sprigs of oak and olive intertwining the scroll signify respectively the new ship’s mastery of modern naval warfare and the peace Stephen Decatur fought so hard to achieve. SHIELD: Per chevron Azure (Dark Blue) and Or, a tiger’s head erased Gules, garnished Argent, within a palm wreath Vert, the whole between two chevronels of the second; on a chief wavy of the fourth, a fess couped of the first bearing four mullets of the fourth. CREST: Issuant from a wreath Or and Azure (Dark Blue), a demi-trident of the first surmounted by two naval swords Proper in saltire, points up, within eighteen mullets enarched of the second. MOTTO: DYNAMIS EX CARDIAS (translates to ‘THE WILL TO FIGHT FROM THE HEART’). Symbolism: Dark blue and gold are the colors traditionally associated with the Navy, representing the sea and excellence. The chevron denotes the prow of the ship; the chevronels commemorate the previous two ships named for Admiral Dewey. The tiger, the symbol of fierceness, valor and dangerous when enraged to combat, signifies his bravery as he commanded the Asiatic Squadron to sail to Manila and destroy the Spanish fleet, without a single loss of American life. The palm fronds indicate the Pacific combined with the tiger’s head, symbolizing Admiral Dewey being renowned as the ‘HERO OF MANILA’. The wavy chief represents the Admiral’s authority, when he assisted in the capturing of Manila. The fess and stars highlight the highest promotion created by Congress for Admiral Dewey, awarded the rank ‘ADMIRAL OF THE NAVY’ and honors his distinguished service to his country. CREST: The trident denotes sea prowess and the modern warfare capabilities of the USS DEWEY. The crossed naval swords symbolize Admiral Dewey’s long military career that extended past the legal retirement age. The stars represent the 18 battlestars earned by the previous ships, for service that stretched the length of World War II to Vietnam. MOTTO: The colors of the scroll allude to the ribbon of the Dewey Medal, established by Congress to commemorate the Battle of Manila Bay. The inscription “DYNAMIS EX CARDIAS’ denotes that heart and the will to fight drive the warrior, nothing else matters. SHIELD: Azure, a gauntlet appaume Argent grasping a broken chain fesswise Or and a Naval sword and marine mameluke points down saltirewise Proper, in chief a mullet one point down Celeste fimbriated of the third. CREST: Issuing from wreath Argent and Azure two tridents heads pilewise Gules, overall a bald eagle’s head Proper. MOTTO: A scroll Or doubled Gules inscribed “FAITH WITHOUT FEAR” Azure. SUPPORTERS: On either side of the shield a missile Argent. SEAL: The coat of arms in full color as in the blazon, upon a white oval enclosed within a dark blue border edged on the outside with gold rope and bearing the inscription “USS DONALD COOK” above and “DDG 75” in base all gold. SHIELD: Dark blue and gold are the colors traditionally used by the US Navy. Red is emblematic of valor and sacrifice. The revised star denotes the Medal of Honor, our country’s highest honor, posthumously awarded to Colonel Donald G. Cook for his spirit of sacrifice and extraordinary heroism. The gauntlet grasps a broken chain underscoring Colonel Cook’s internment as a prisoner of war by the Viet Cong during which he unselfishly put the interests of his comrades before that of his own well-being, and eventually, his life. The swords are crossed to signify the spirit of teamwork, while symbolizing the heritage of the US Navy and Marine Corps. The mameluke represents Colonel Cook’s service as a Marine. CREST: The eagle symbolizes the principles of freedom upon which our country was founded and highlights military vigilance and national defense. The tridents represent sea power and underscore USS Donald Cook’s Aegis firepower and the capability to conduct operations in multi-threat environments. SUPPORTERS: The missiles symbolize vigilance, resolve and battle preparedness, while suggesting the USS Donald Cook’s vertical launch capabilities. The Fitzgerald family coat of arms (a white shield with a red saltire) provides the foundation for the coat of arms for USS Fitzgerald. The shield signifies defense, while the saltire connotes strength and its red color represents valor and action. This traditional design has been modified by the addition of a blue cross paty interlaced with a gold annulet and four shamrocks. The cross commemorates the Navy Cross posthumously awarded to Lieutenant William Charles Fitzgerald for extraordinary heroism in the Vietnam battle that took his life. The annulet symbolizes the continuity of everlasting hope, fidelity and unity. The four shamrocks represent Lieutenant Fitzgerald's Irish family and heritage. Supporters: The sword and cutlass crossed behind the shield depict Lieutenant Fitzgerald's personal experiences as both an officer and enlisted sailor, as well as the professional excellence and teamwork in the United States Navy. The dolphins flanking the shield signify maritime dominance and allude to Fitzgerald's role in preserving America's command of the seas. Crest: The trident, a traditional symbol of maritime prowess, represents both Lieutenant Fitzgerald's graduation from the United States Naval Academy and Fitzgerald's war fighting capabilities. Each tine of the trident depicts separate warfare areas—air, surface and sub-surface—in which Fitzgerald possesses unmatched strengths. Lions, the traditional symbol for strength and courage on land, support each side of the trident. They commemorate the circumstances under which Lieutenant Fitzgerald gave his life and to signify the eternal vigilance and teamwork necessary to project America's maritime power ashore. Motto: The scroll, in the national colors of red, white, and blue and emblazoned with the motto "PROTECT YOUR PEOPLE," bears testimony to the ideals and actions exemplified throughout the life of William Charles Fitzgerald. This motto also links the Fitzgeralds' ancient family history—their Gallic war cry translates as "Defend the castle forever" -- with the gallantry, dedication and extraordinary heroism of Lieutenant Fitzgerald and the honored traditions of the United States Navy. SHIELD: Per fess Or and Argent from a bar embattled counter-embattled issuing five flashes pilewise Gules, in base a mullet one point down Celeste, a bordure Azure. CREST: From a wreath Or and Gules a Marine Mameluke and Naval sword saltirewise points up Proper supporting an eagle displayed Or. MOTTO: A scroll Gules doubled and inscribed “BEYOND THE CALL” Or. SEAL: The arms as blazoned in full color upon a white oval enclosed by a blue collar edged on the outside with a gold chain and bearing the name “USS GONZALEZ” at the top and “DDG 66” in base all gold. SHIELD: Dark blue and gold are the colors traditionally associated with the Navy and symbolize sea and excellence. Red is emblematic of valor and sacrifice. The embattled line reflects the Citadel and alludes to a strong defense. The flashes depict speed and the electronic capabilities of the Aegis system while reflecting Marine Sgt. Alfredo Gonzalez’s bravery under fire. The reversed blue star represents the Medal of Honor, our country’s highest honor, awarded to Sgt. Gonzalez, the ship’s namesake, for his sacrifice and bravery. The border symbolizes unity and cooperation while the Aegis shaped shield highlights USS GONZALEZ’S ability to conduct mult-mission warfare operations with quick decisive action. CREST: The eagle is adapted from the Marine Corps Seal and reflects leadership and courage.The two swords, Navy and Marine, are crossed for strength and teamwork and honor both services. The crest and shield were designed to honor the memory of Colonel William "Rich" Higgins, USMC and to signify the power of the warship that bears his name. - Dark blue and gold are traditional colors of the Navy, symbolizing the sea and excellence. - The griffin, denoting valor and intelligence, holds an axe that indicates HIGGINS’ readiness and ability to engage in land-based hostilities. - The griffin and the trident symbolize ’ modern weapon systems HIGGINS possesses, which gives her the versatility of air combat and undersea engagements. - The shield’s “V” signifies victory and recalls the Combat “V” earned by Colonel Higgins. - White denotes integrity; gold symbolizes excellence. - The cloverleaf on the shield stands for good fortune. - The crest’s anchor represents the Navy. - Two wreaths symbolize the many military and civilian honors awarded Col. Higgins and signify unusual achievement. - The Naval Officer’s sword and the Marine Corps Officer’s Mameluke emphasize the long-standing tradition of cooperation between the Navy and Marine Corps in both peacetime and war, and recall Col. Higgins’ outstanding service to his country as a Marine. SHIELD: Azure, in base two chevronels Or, on a pale Gules an unsheathed enlisted sword point down Proper, overall a crested helmet of antiquity of the second garnished Purpure, in dexter chief a mullet Or, a bordure of the last. CREST: On a wreath Or and Azure the inverted star of the Medal of Honor Proper surmounted by the Marine Corps eagle, globe and anchor insignia Argent intertwining in base the Combat Action Ribbon Proper. SEAL: The device as described above with a dark blue motto scroll doubled gold intertwining the handles of the supporting swords and inscribed “Semper Fidelis Semper Fortis” translates to “Always Faithful, Always Strong” in gold, all upon a white rectangular field radiused top and bottom and enclosed within a dark blue collar edged on the outside with gold rope and inscribed at top “USS JASON DUNHAM” and in base “DDG 109” in gold letters. SHIELD: The colors Dark Blue and gold represent the United States Navy.The two chevronels in base recall Corporal Dunham’s rank.The scarlet pale represents the Marine Corps and refers to the trouser stripe worn by Non Commissioned Officers.The Marine Corps Non Commissioned Officers sword on the stripe is point down, signifying Dunham’s sacrifice of his life to protect his troops.The helmet of antiquity recalls the service traditions of brotherhood which hold true today and recalls the incident of enemy attack on Dunham’s squad during which he used his helmet to contain a grenade and covered it with his body to protect his squad at the cost of his own life.The purple detail on the helmet refers to the Purple Heart Medal awarded Dunham.The distinctive shield shape is that used on the state arms of New York, Corporal Dunham’s home state.The gold mullet in dexter chief signifies the loss of Corporal Dunham to his service and his family.The gold border denotes the unity and cohesion of Marine Corps service members which characterize the force and clearly influenced Dunham’s action in defense of his troops. SHIELD: The colors Dark Blue and gold represent the United States Navy.The two chevronels in base recall Corporal Dunham’s rank.The scarlet pale represents the Marine Corps and refers to the trouser stripe worn by Non Commissioned Officers.The Marine Corps Non Commissioned Officers sword on the stripe is point down, signifying Dunham’s sacrifice of his life to protect his troops. The helmet of antiquity recalls the service traditions of brotherhood which hold true today and recalls the incident of enemy attack on Dunham’s squad during which he used his helmet to contain a grenade and covered it with his body to protect his squad at the cost of his own life.The purple detail on the helmet refers to the Purple Heart Medal awarded Dunham.The distinctive shield shape is that used on the state arms of New York, Corporal Dunham’s home state.The gold mullet in dexter chief signifies the loss of Corporal Dunham to his service and his family.The gold border denotes the unity and cohesion of Marine Corps service members which characterize the force and clearly influenced Dunham’s action in defense of his troops. CREST: The decorations awarded Corporal Dunham are represented along with the eagle, globe and anchor insignia of the United States Marine Corps; the inverted mullet symbolizes the Medal of Honor, the nation’s highest decoration for valor awarded to Corporal Dunham for his sacrifice in protecting his squad, and the Combat Action Ribbon, awarded to him along with the Purple Heart Medal, which is referenced on the antique helmet appearing on the shield. SUPPORTERS: To dexter side an Navy officer’s sword, to sinister an enlisted sailor’s cutlass, saltirewise points up Proper, representing the full complement of the ship’s crew. SHIELD: Azure (Dark blue), a chevron reversed Celeste, charged with eight mullets Argent between in chief a sea lion Or grasping a life ring Proper and in base a compass rose Argent. CREST: From a wreath Or and Azure (Dark blue), two palm fronds Vert superimposed by two lightning flashes saltirewise Gules and overall a demi-trident Or. SEAL: The coat of arms as blazoned in full color on a white oval enclosed by a dark blue border edged on the outer side with a gold rope and inscribed “USS LASSEN” above and “DDG 82” below in gold. SHIELD: Dark blue and gold are the colors traditionally used by the Navy. The Aegis shield highlights the modern weaponry of the USS Lassen. The blue chevron recalls Lt. Lassen’s service in the coastal campaign during the Vietnam War. It also simulates the prow of the ship, alluding to the mission as an ammunition ship, which rearmed many of the major fleets. The heraldic sea lion symbolizes strength and courage, demonstrated by Lt. Lassen. The chevron suggests the Medal of Honor awarded for Lt. Lassen’s heroism, above and beyond the call of duty, for the rescue of two aviators. The compass rose symbolizes the landing lights of his helicopter, while rescuing the aviators, revealing his position to the enemy, when illumination was lost. CREST: The palm fronds suggest the first Lassen’s area of operations in the Pacific; the flashes symbolize striking capabilities and refer to the first Lassen’s service in World War II, rearming many of the major fleets. The trident’s three tines represent battlestars earned during World War II in the Pacific as well as denoting the multifaceted offensive/defensive armament of the present DDG-82. SEAL: The coat of arms in full color as in the blazon, upon a white background enclosed with a dark blue oval border edged on the outside with a gold rope and bearing the inscription "USS MAHAN" at top and "DDG 72" at bottom in gold. SHIELD: Dark blue and gold are the colors traditionally used by the Navy and represent the sea and excellence. The trident, symbolizing sea power, denotes DDG 72’s warfare capabilities and underscores the importance of a strong Navy. The gauntlet and torch are adapted from the previous USS Mahan’s emblem and highlight the ship’s namesake, Rear Admiral Alfred Thayer Mahan, as the father of all modern navies. The tines of the trident represent the three previous ships named MAHAN, as well as the Officer, Chief Petty Officer and Enlisted Corps of personnel which man the ship. CREST: The central star commemorates the second USS Mahan’s World War II battle honors (five battle stars), earned before she was sunk by Kamikazes. The twelve small stars on the gauntlet denote the battle stars of the third USS MAHAN for service in the Vietnam War. The unfurled scroll underscores Mahan as the author of "The Influence of Sea Power Upon History (1660-1783)". The compass rose and gauntlet represent Mahan’s influence of sea power, its strategy and geopolitical importance worldwide. The wreath combines laurel and palm to symbolize honor and victory. MOTTO: The motto was chosen in remembrance of Admiral Arleigh Burke in memory of his many contributions to the U.S. Navy. During the commissioning of the USS ARLEIGH BURKE, Admiral Burke issued the following challenge to those who man this class of ship: "This ship is built to fight; you’d better know how." SUPPORTERS: The crossed swords express strength through teamwork and cooperation from the Enlisted and Officer Corps. Represented are the enlisted cutlass and the officer sword. SHIELD: Argent two chevronels Gules between two lion’s heads respectant erased Azure and a demi-trident Proper. CREST: Upon a helm superimposed on a United States Naval Officer’s sword and a cutlass saltirewise points down Proper and rising from a wreath Argent and Gules, a laurel wreath Proper, overall a fouled anchor Azure interlaced with a cross paty Or. SUPPORTERS AND MOTTO: A scroll Argent edged Gules doubled Azure, inscribed “PROUDLY WE SERVE” of the like interlaced by two laurel branches superimposed at crosspoint by a shamrock Proper. This motto is given by the African American Sailors of DE 529 who sailed in her during World War II and made history with their selfless bravery in the defense of our country. SEAL: The coat of arms as blazoned in full color upon a white oval enclosed by a dark blue collar edged on the outside with a gold rope and bearing the inscription “USS MASON” at top and “DDG 87” in base all in gold. SHIELD: Dark blue and gold are the colors traditionally used by the Navy; red, white and blue are our national colors. The two chevrons commemorate DD 191 and DE 529, the two previous ships named “USS MASON.” The opposing lions, which are adapted from the Mason Family Coat of Arms, represent the World War II Pacific and Atlantic campaigns. The left facing lion symbolizes the service and sacrifice of Ensign Newton Henry Mason in the Battle of the Coral Sea. The right facing lion symbolizes the crew’s courageous actions in the North Atlantic during Convoy NY 119 in the ship bearing Ensign Mason’s name. The trident, symbol of sea prowess, symbolizes DDG 87’s modern warfare capabilities: The Aegis Weapons System, Theater Ballistic Missile Defense and Cooperative Engagement Capability. CREST: The helm symbolizes a strong defense and the projection of power. The anchor refers to John Young Mason, namesake of DD 191 who was Secretary of the Navy under Presidents John Tyler and James K. Polk. The cross alludes to the Distinguished Flying Cross awarded to Newton Henry Mason. The wreath denotes the many awards, honors and achievements of the previous ships named MASON and the crews who served them. SUPPORTERS: Laurel is emblematic of honor and high achievement of the African American crew of DE 529 and marks their selfless contribution to the eventual desegregation of the Navy. The shamrock is symbolic of their good fortune during arduous operations in the North Atlantic and the warm Irish welcome afforded them on their port visit to Northern Ireland. SHIELD: Azure, a bend Celeste spattered with thirty-four mullets Argent between the Roman numeral “XV” Gules fimbriated of the third and a cross patee Or charged with a hurt bearing a mullet White. CREST: From a wreath Argent and Azure, two tridents chevronwise reversed of the first superimposed by a mullet reversed flory Or voided Celeste bearing a sea lion grasping a sword of the third, in base the shield of the coat of arms of the United States winged and anchored of the like. MOTTO: A scroll Azure doubled and inscribed “RELENTLESS IN BATTLE” Or. SEAL: The arms as blazoned in full color upon a white oval enclosed by a Dark blue collar edged on the outside with a gold rope and bearing the inscription “USS MCCAMPBELL” at top and “DDG 85” at base all in gold. SHIELD: Dark blue and gold are the colors traditionally used by the Navy and represent the sea and excellence. The light blue bend reflects the Pacific theater, where Captain McCampbell served as commander of Air Group 15. The “Fabled Fifteen”, based on the USS ESSEX, is symbolized by the Roman numeral “XV”. The thirty-four stars allude to the number of enemy aircraft destroyed by Captain McCampbell in air to air combat, distinguishing him as the leading Navy ace of World War II. The star and cross highlight the Navy Cross and Silver Star awarded to Captain McCampbell, for his gallantry and bravery during combat in the Philippines. SHIELD: Azure bordured Or over a chevron of the last a Maltese Cross Gules fimbriated of the second charged with a Spartan shield Bronze surmounted by a chevron reversed below a double saltire fess wise Purpure, overall in base a sword erect pommel and guard polished metal gripped of the third blade Argent detailed of the fourth and enflamed Proper, seven mullets three and four of the fifth arrayed on a chief arched Celeste. < H4> Above a wreath Or and Azure upon a rolled and turned Red, White and Blue ribbon a depiction of the SEAL Trident Proper fimbriated Navy Blue. SUPPORTERS: A sword and cutlass in saltire Proper. PENDANT: The Medal of Honor. MOTTO: A Navy Blue scroll bordered and turned Gold and forming the initials M and M, a tribute to the ship’s namesake and his mother, Maureen Murphy, is inscribed “LEAD THE FIGHT” in Gold letters. SEAL: The coat of arms as blazoned in full color upon a white oval enclosed by a dark blue collar edged on the outside with a gold rope and bearing the inscription “USS MICHAEL MURPHY” at top and “DDG 112” in base all in gold. SHIELD: The shape is taken from the shield on the New York State Seal, to indicate Michael Murphy’s home state. Navy blue and gold are the traditional colors of the Navy, and the shield is divided by a chevron which symbolizes the ship on a dark blue sea horizoned by a starry sky which here is the light blue chief with seven white stars that recalls the Medal of Honor colors with the stars alluding to the ship’s and SEAL team operations across the seven seas. The Maltese Cross stands as recognition of FDNY Engine Company 53 and Ladder Company 43 which were used as inspiration for LT Murphy’s SEAL Team and tied his motivation to the events of September 11, 2001. The flaming sword of Michael the Archangel, for whom he was named, and the Spartan shield are reflective of his fateful battle and SEAL warrior ethos. The purple detail line on the sword, double saltire and chevron reversed on the Spartan shield is representative of the Purple Heart awarded to the 20 Americans who were part of Operation RED WINGS and all the service men and women who have sacrificed for their country. The Medal of Honor, the nation’s highest decoration for valor, draped as being worn by LT Murphy, is a reminder of his ultimate sacrifice for his teammates and his being the first Medal of Honor recipient from the war in Afghanistan and the first Navy recipient since the Vietnam War. CREST: The rolled and turned red, white and blue ribbon honors the patriotic service of the SEAL teams since their formation, surmounted here by the SEAL Trident which LT Murphy was proud to wear. SUPPORTERS: The sword and cutlass represent the officers and crew of USS Michael Murphy (DDG 112). CREST: On a wreath Or and Azure (Dark Blue) in front of a laurel wreath two officer’s swords, hilts to base chevron-wise reversed Proper between two mullets of the first and intertwining a riband of the second garnished of one stripe Or and doubled Gules, all superimposed by a stylized Naval Cross of the first. MOTTO: A scroll Azure doubled and inscribed "READY NOW” Or. SEAL: The coat of arms in full color as in the blazon, all upon a white background and enclosed within a dark blue ova border edged on the outside with a gold chain and bearing the inscription “USS MOMSEN” at top and “DDG 92” in base all gold. SHIELD: Gold and Dark Blue represent the Navy; Celeste (Light Blue) symbolizes worldwide capability. The wavy chevron rompu signifies the Momsen’s mission of support to Navy and Marine Corps convoys and amphibious forces. The upper portion of the chevron is freed and rising from the main body to represent the Momsen Bell and Momsen Lung devices conceived and developed by Vice Admiral Momsen to save trapped mariners from damaged and sunken submarines. The demi-trident symbolizes advanced weaponry and sea power and its times recall the attack pattern employed by Vice Admiral Momsen against convoys of Japanese shipping during World War II. The dolphin, traditional friend of the sailor, denotes ocean going skills and expertise and refers to the life-saving operations in which the Vice-Admiral was engaged for much of his Naval career. The anchor represents the individual sailor. CREST: The stylized Navy Cross refers to that awarded to Vice Admiral Momsen for his heroism as Commander of an attack group of submarines against Japan’s forces in the East China Sea during World War II. The blue and gold riband recalls the Distinguished Service Medal he received among many awards for his wartime service; the two gold stars refer to the Legion of Merit. The swords denote readiness and ability to fight. Together, in the form of the letter “V”, they represent the Vice Admiral’s Combat Awards. The wreath, symbol of honor and achievement, recalls the many and various decorations made to him during his distinguished career. The scarlet doubling on the riband symbolizes courage and sacrifice and refers to Navy support to Marine Corps forces. Gold denotes excellence. SHIELD: Azure (Dark Blue), a delta Argent (Silver Gray) enflamed Proper surmounted by a stylized battleship gun turret of the second superimposed by an annulet Gules, bearing a polestar Azure, between four mullets, two and two, Or. CREST: From a wreath Argent and Azure (Dark Blue), two palm fronds Vert overall the Surface Warfare Officer device Proper flanked by two dolphins urinant embowed respectant Gules, all below three arcs of thirteen mullets, five, five and two Or. MOTTO: A scroll Argent edged Azure inscribed ‘TOUJOURS, L’AUDACE’ Gules. SEAL: The coat of arms in full color as in the blazon all upon a white background and enclosed within a dark blue oval border edged on the outside with gold rope and bearing the name “USS MUSTIN” at top and “DDG 89” in base in gold letters. SHIELD: Dark blue and gold are the colors traditionally used by the Navy and represent the sea and excellence. The enflamed delta symbolizes the diverse missile capabilities of the destroyer and the advent of the Tomahawk weapons system aboard surface combatants spearheaded by VADM Henry C. Mustin. The five points of flame represent the five wars where Mustin family members fought. The triple-barreled battleship gun turret highlights VADM Lloyd M. Mustin’s (1911-1999) renowned gunnery expertise throughout his career; his remarkable experiences during the naval battle of Guadalcanal aboard the cruiser ATLANTA; and, after her sinking, service with the First Marine division on Guadalcanal. The barrels of the gun turret also reflect the three generations of the Mustin Family who faced combat under fire. The red annulet denotes unity, courage and valor. The polestar honors VADM Henry C. Mustin, a decorated Vietnam veteran, who became the commander of NATO’s largest fleet and Deputy Chief of Naval Operations during the 1980’s. The combination of the annulet and polestar symbolizes the early gunsight developed by CAPT Henry C. Mustin (1874-1923) and the lead computing anti-aircraft gunsight developed by VADM Lloyd M. Mustin, a key to the United States’ success in anti-aircraft action in the Pacific during World War II. The four stars commemorate the Bronze Stars awarded to the Mustin Family for service in Vietnam – three for VADM Henry C. Mustin and one for LCDR Thomas M. Mustin, Officer in Charge of Patrol Boat River Section 511, Mekong Delta; combined with the polestar in the “V-shape” symbolize the Bronze Stars with Combat awarded to the Mustin Family for service Vietnam. CREST: The palm fronds represent achievement and victory, during the campaigns in the Pacific. The thirteen stars commemorate the thirteen battle stars on the Asiatic-Pacific Area Service Ribbon earned by the first USS MUSTIN (DD 413) for her contributions to major operations in the Pacific throughout World War II. The dolphins symbolize search and rescue, also alludes to the first Mustin rescue of 337 crewmen of the HORNET, as they abandoned ship after being torpedoed. The Surface Warfare Officer device reflects the sea service of the Mustin Family and the Surface Warfare excellence of the two destroyers. SUPPORTERS: The Naval Aviator “Wings of Gold” device honors Captain Henry C. Mustin, designated Naval Aviator Number Eleven, and instrumental in the design of these wings. Captain Mustin was the principal architect of the catapult launch concept; made the first catapult launch of an aircraft from a ship underway; and at Veracruz in 1914, commanded the first United States military aviation unit ever to fly against hostile fire. The four crossed Naval Officer’s swords symbolize the commissioned service of each of the Mustin’s honored in the naming and commissioning of USS MUSTIN (DDG 89). SHIELD: Or, on a fess wavy Azure between three crosses paty convex of the like bearing a mullet Argent, a trident head of the first. CREST: From a wreath Or and Azure the waves of the sea Proper, superimposed by a mullet voided one point down of the second enfiled by a demi-Naval sword enflamed Proper between two dolphins embowed urinant Argent. MOTTO: A scroll Azure doubled Gules fimbriated and inscribed "A TRADITION OF HONOR" Or. SEAL: The coat of arms in full color as in the blazon, upon a white background enclosed within a dark blue oval border edged on the outside with a gold rope and bearing the inscription "USS O'KANE" at top and "DDG 77" in base all gold. SHIELD: Dark blue and gold represent the sea and excellence and are the colors traditionally used by the Navy. The trident, symbol of naval power, underscores USS O'KANE's awesome combat and weapons systems, which allows the ship to dominate the battle space in multi-threat environments. The stylized crosses and stars commemorate the three Navy Crosses and three Silver Stars awarded to Rear Admiral O'Kane for brilliant tactical ability and heroism displayed during war patrols as Executive Officer of USS WAHOO and Commanding Officer of USS TANG. CREST: The dolphins pay tribute to Rear Admiral O'Kane as a submariner. The reversed star represents the Medal of Honor awarded to O'Kane for his extraordinary actions during his last war patrol. Operating independently in enemy-controlled waters, O'Kane decimated two large and heavily protected convoys before TANG went down. The flaming Naval sword rising from the waves highlights the aggressive naval combat action displayed by O'Kane and his crews on every patrol. Red is emblematic of valor and sacrifice, underscoring Rear Admiral O'Kane's time as a prisoner of war. SHIELD: Gules, a chief rayonne Azure fimbriated Argent and overall an anchor fouled bend sinisterwise Or superimposed by a plate bearing a mullet reversed flory Celeste. CREST: From a wreath Argent and Azure an eagle’s head Proper superimposed by two stalks of rice fesswise Proper, and two demi-trident saltirewise Or. MOTTO: A scroll Or fimbriated and inscribed “HONOR AND SACRIFICE” Azure. SUPPORTERS: A United States Navy Officer’s sword and Marine mameluke saltirewise points down Proper. SEAL: The coat of arms as blazoned in full color upon a white oval enclosed by a dark blue collar edged on the outside with a gold rope and bearing the inscription “USS OSCAR AUSTIN” at top and “DDG 79” in base all in gold. SHIELD: Dark blue and gold are the traditional colors associated with the Navy; red is emblematic of valor and sacrifice and white stands for integrity and purity of purpose. The reversed star refers to the Medal of Honor posthumously awarded to Private First Class Oscar P. Austin, United States Marine Corps, for his self-sacrifice and extraordinary heroism when he threw himself between an enemy grenade and an injured Marine and was mortally wounded by an enemy who was about to shoot his fallen comrade. The white of the globe and medium blue of the star are the colors of the ribbon of the Medal of Honor; the reversed star is the silhouette of its pendant. The white globe and anchor, suggesting the United States Marine Corps seal, represent the Navy’s global mission. The flames allude to the fire-swept terrain and the enemy fire where PFC Austin gave his life to assist his wounded comrades. CREST: The tridents, symbols of sea prowess, represent DDG 79’s modern warfare capabilities: the Aegis Weapons and Vertical Launch Systems. Each tine on the trident depicts separate warfare areas: air, surface and sub-surface. The two are crossed to denote multiple capabilities. The rice stalks suggest Vietnam where PFC Oscar P. Austin served; the eagle, our National emblem, symbolizes the freedom and principles for which PFC Austin gave his life. SUPPORTERS: The crossed Navy sword and Marine Mameluke represent cooperation and strength. The Mameluke commemorates PFC Oscar P. Austin’s service with the Marine Corps. SHIELD: Gules, on a grid shaped as an Aegis shield Sable the head of a trident issuing from base Argent (Silver Gray); overall a bald eagle’s head erased Proper. CREST: On a wreath Argent and Gules a laurel wreath Proper surmounted by a demi-compass rose Celeste; overall a stylized Navy Cross Or. MOTTO: A scroll Azure fimbriated and inscribed “PROUD TO SERVE” Or. SEAL: The arms as blazoned in full color upon a white oval enclosed within a dark blue collar edged on the outside with a gold chain of ninety-one links and one locking link (a canting reference to the sip’s designation as DDG 91) with the name “USS PINCKNEY” above and “DDG 91” below in gold letters. SHIELD: Gules (Scarlet) denotes courage and sacrifice. The black grid shaped like an Aegis shield refers to the destroyer class to which the Pinckney belongs and its state of the art equipment and armament. It also suggests a mess grill, symbolizing the duties of William Pinckney as Navy Cook Third Class aboard the USS Enterprise at the time of his heroic act in saving his shipmate. The trident symbolizes authority at sea. The eagle’s head denotes vigilance, resolve and seagoing defense of the United States. White (Argent) indicates integrity; black (Sable) signifies strength and fortitude. CREST: The Navy Cross indicates the award for heroism made to William Pinckney for his exemplary actions under fire in saving the life of a fellow sailor during the battle of Santa Cruz. The compass-rose signifies navigational expertise and global action during World War II. The wreath of laurel represents honor and achievement. SHIELD: Quarterly Azure and Or two mullets counterchanged above an Aegis shield Gules bordered Argent bearing the torch from the Statue of Liberty Or. CREST: From a wreath Or and Azure two Naval Officers' swords saltirewise points down surmounted by a cubit arm between six radiating laurel leaves Proper and supporting a trident Argent, all in front of a wreath of laurel of the first. MOTTO: A scroll Or doubled and inscribed "FREEDOM'S CHAMPION" Azure. SHIELD: Dark blue and gold represent the sea and excellence and are the colors traditionally used by the Navy; red is emblematic of sacrifice and courage. The quartered shield recalls the four previous ships named USS PORTER and highlights the four cardinal compass points of the U. S. Navy’s worldwide mission. The stars commemorate the battle stars earned in World War II by the second and third USS PORTER. The Aegis shield symbolizes DDG 78’s modern warfare capabilities designed to protect our nation and ideals. This shield is red to reflect courage and action. The torch, from the Statue of Liberty, suggests the ship’s motto and symbolizes the principles of freedom upon which our country was founded. CREST: The crossed Naval Officers’ swords honor David Porter and his son, David Dixon Porter. The laurel, arm and trident are adapted from the United States Naval Academy’s coat of arms and highlight David Dixon Porter’s tenure as Superintendent and the notable improvements he made to the maritime and academic curriculum. The trident, symbol of sea power, alludes to the Aegis Weapons System. The three tines represent PORTER’s capability in air, surface, and subsurface warfare as well as the three military conflicts in which the Porter family served with distinction: the War of 1812, the Mexican War, and the Civil War. The gold wreath symbolizes the excellence demonstrated by both officers and each ship that bears their name. SHIELD: Per fess embattled Or and Azure (Dark Blue) a chief rayonny Gules charged with a ship’s topsail, crow’s nest and pennant Argent; in base the head of a lion erased Or, langued and armed of the third surmounting a naval officer’s sword and antique cutlass hilts to base saltirewise Proper. CREST: On a wreath Or and Azure (Dark Blue) a laurel wreath Proper surmounted by a stylized compass rose of the first, thereon an Aegis radar escutcheon of the second charged with a cinquefoil pierced Argent. 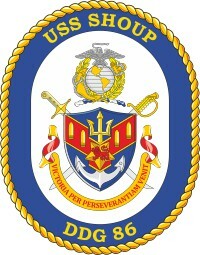 MOTTO: A scroll Azure fimbriated and inscribed “INTREPID PATRIOT” Or. .
SEAL: The coat of arms in full color as in the blazon all upon a white background and enclosed within a dark blue oval border edged on the outside with gold rope and bearing the name “USS Preble” at top and “DDG 88” in base in gold letters. SHIELD: Gold and dark blue are the traditional colors associated with the Navy. Commodore Preble’s attack and bombardment of the harbor at Tripoli in 1803 during his campaign against Barbary pirates is recalled by the embattlement and rayonny scarlet chief representing the fire and destruction he rained on the port. Scarlet symbolizes courage and Commodore Preble’s fiery resolve and determination to end attacks upon American trading vessels in the region. The ship’s sail further recalls his successful attack and blockade of Tripoli and refers to his other distinguished U.S. Navy commands, particularly of the USS Constitution and the frigate Essex. The head of the lion is derived from the Preble family coat of arms and symbolizes courage and strength. The crossed cutlass and sword represent combat and the readiness, past and present, to defend United States interests. Argent, or silver, signifies integrity, gold denotes excellence. CREST: The eight battle stars earned by USS Preble (DD 345) for World War II service are recalled by the points of the compass rose and by the laurel wreath, which signifies honor. The compass rose indicates worldwide capabilities and service of the new Preble and it’s predecessors. The blue escutcheon, in the shape of the radar cover panel used on Aegis vessels, represents the advanced technology and weapons systems of the new ship. It is charged with a cinquefoil, recalling the five previous ships to honorably bear the name Preble. Argent, or silver, denotes integrity and valor, gold signifies excellence. MOTTO: The colors used, blue and gold, represent the United States Navy. SHIELD: Azure, a fret Argent, a demi-sun in glory issuing from chief Or, interlacing the fret a sword throughout Proper, an orle of the third. CREST: From a wreath Argent and Azure a demi-sun in glory Or superimposed by a demi-ship’s wheel Proper surmounted by a lozenge of the second garnished Or charged with a rose Gules. MOTTO: On a scroll Azure doubled Argent garnished Gules the motto “LEADERSHIP TRUTH LOYALTY” in gold letters. SEAL: The coat of arms in full color, as in the blazon, upon a white oval, within a dark blue border edged with gold rope on the outside and inscribed “USS ROOSEVELT” at the top and “DDG 80” at the bottom, all in gold. SHIELD: Blue and gold represent the Navy. President Roosevelt’s leadership skills in bringing stability and strength to American society during the crises of the Depression and the threat of fascist aggression are symbolized by the fret. His calls to Americans for preparedness and confidence and his resolve during World War II are denoted by the sword, which indicates also DDG 80’s readiness to deploy her modern weaponry in defense of the country. The demi-sun signifies truth and the aspirations for a better world which President Roosevelt encouraged Americans to share with him. The orle signifies the unity he brought to the country and the all-encompassing areas of responsibility of his office which he administered so ably. White represents integrity and loyalty, gold denotes excellence. CREST: The demi-burst signifies the splendid achievement of Franklin D. Roosevelt’s Presidency, to bring the United States out of domestic crisis and through world-wide conflict. The ship’s wheel recalls his appointment in 1913 as Assistant Secretary of the Navy. It denotes also his success in guiding America through the difficult years of his Presidential terms. The lozenge, traditionally a feminine heraldic symbol, is a reference to his wife, Eleanor Roosevelt, who assisted him politically and became a force in her own right. The sides of the lozenge represent his four elections to the Presidency. The rose, state flower of New York, recalls his governorship of that state and is a canting reference to his family name. Scarlet denotes courage and sacrifice, gold indicates excellence. SHIELD: Azure (Dark Blue) an eagle affronte guardant wings displayed Or, the breast surmounted by an escutcheon of the head of Medusa with encircling serpents Bronze within a bordure Gules edged on the inside of the second, all upon an officer’s sword and a saber saltirewise points down Proper; in orle fourteen mullets Or, the center mullet in chief enlarged between the sword hand guards. CREST: On a wreath Or and Azure (Dark Blue), upon a compass rose Gules a representation of the anchor and mullet of the Distinguished Service Medal; in base between two sprigs of hawthorn blossom an open technical book supporting a slide rule Proper, all upon a laurel wreath of the last. SEAL: The device as described above on a white field enclosed within a dark blue collar edged on the outside with gold rope and inscribed at top “USS WAYNE E. MEYER” and in base “DDG 108” in gold letters. SHIELD: The shape of the arms enclosure, derived from the cover of the Aegis array assembly, represents Aegis engineering and refers to the mythological shield of Zeus: a reminder that Aegis has been the shield of the fleet for decades, as it will be for decades to come. The left supporting Talos missile refers to the Admiral’s early career and his duties in USS Galveston (CLG-3) where he served as Fire Control and Gunnery Officer at the birth of modern missilery in the United States. The right supporting SM2/3 missile refers to the evolution from Talos to the modern Standard Missile. The eagle and swords recall the firepower of the ship and its readiness to defend our Nation. The Medusa escutcheon recalls the mythology of Zeus and the power of the Aegis system to effectively petrify an enemy. The orle of gold stars refers to Admiral Meyer’s thirteen years of leadership, vision and commitment as founding project manager of Aegis Shipbuilding. The larger fourteenth star refers to his rise to the ranks of Admiralty. The Navy Blue book binding and scarlet bordure of the Medusa escutcheon denotes unity, purpose and courage: values of the greatest generation epitomized by RADM Meyer. Dark blue represents the U. S. Navy, gold signifies excellence. CREST: The mullet and anchor record Rear Admiral Meyer’s award of the Distinguished Service Medal, the compass rose denotes world wide achievement; the color scarlet signifies sacrifice and courage. The wreath and sprig of Hawthorn Blossom at the base denote distinctive honor and Meyer’s heritage and origins in the fertile gumbo region of the great state of Missouri. The opened technical book and slide rule represent the engineering rigor required in shipbuilding, and recall RADM Meyer’s disciplined approach to engineering excellence as well as the solid engineering foundation gained through schooling. MOTTO: “ONE POWERFUL LEGACY” in gold on a dark blue scroll garnished gold and doubled Celeste Blue. SHIELD: Per fess enhanced nebuly Argent and Gules, a cross of the like surmounted by a fleur-de-lis Azure, in base a book expanded Or, leaved of the first below a lion passant guardant of the fourth. CREST: From a wreath Argent and Gules a trident head per chevron Azure and of the first superimposed by a wreath of laurel and oak Or. MOTTO: A stacked bipartite scroll Gules doubled Argent inscribed "IN WAR: RESOLUTION" and "IN PEACE: GOOD WILL" Or. SUPPORTER: A garter Azure fimbriated and inscribed "THE MOST NOBLE ORDER OF THE GARTER" Or. SEAL: The arms as blazoned in full color upon a white oval enclosed by a dark blue collar edged on the outside with a gold rope and bearing the name "USS WINSTON S. CHURCHILL" at top and "DDG 81" in base all gold. SHIELD: The cross of St. George and the fleur-de-lis are adapted from Churchill's augmentation on an inescutcheon on his ancestral coat of arms. Red is emblematic of valor and sacrifice. The red cross on the white field refers to the flag of St. George (he became the patron of the Order of the Garter in 1348). The gold lion on the red field recalls Great Britain's heritage. The lion embodies strength, courage and determination. The nebuly alludes to the sky or clouds and highlights Britain's taking of the full thrust of German airpower in the Battle of Britain. The stylized book underscores Winston Churchill's reputation, not only as a gifted statesman and inspiring war leader, but also a great orator and author who was awarded the Nobel Prize in literature. He unified the British people with his stirring oratory, energy and resolve. CREST: The trident symbolizes sea prowess and highlights the USS WINSTON S. CHURCHILL's vertical launch capabilities; the three tines represent anti-submarine surface and air warfare capabilities. The trident is divided per chevron suggesting a "V" emphasizing victory in war (Winston Churchill's famous rallying sign) and defense strength in peace. The laurel recalls honor and high achievement; oak, strength and resolve. SUPPORTER: In 1953, Queen Elizabeth II made Churchill a Member of The Most Noble Order of the Garter; the premier British Order of chivalry and the highest honor she could bestow.